What's better than a Ring of Gold? A Ring of Diamonds! Last weekend saw Top Rank travel to Macau for the brilliant "Ring of Gold" card. 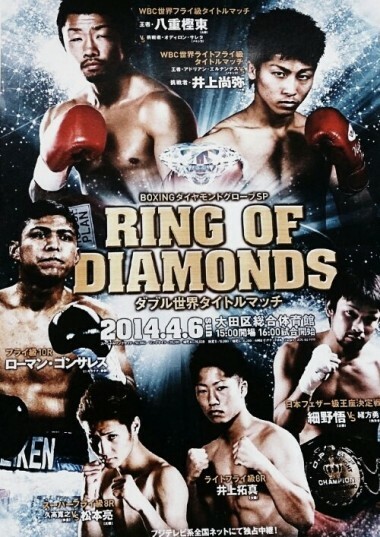 It seems that the name has struck accord with Japanese promoter Hideyuki Ohashi who has announced that the name of his upcoming show on April 6th will be "Ring of Diamonds". Whilst Ring of Gold got it's name from the fact that it had a trio of Olympic gold medal winners it seems that Ring of Diamonds has gotten it's name from the boxing diamonds on show on the card. This includes Japan's fast rising Naoya Inoue, Naoya's younger brother Takuma Inoue, the young Ryo Matsumoto and the exceptionally talented Roman Gonzalez. As well as the unbeaten diamonds the show the show is also set to feature current WBC Flyweight champion Akira Yaegashi and former 3-time title challenger Satoshi Hosono who will be attempting to claim the Japanese Featherweight title. Whilst opponents for bother Gonzalez and Takuma Inoue have yet to be named we're expecting both to face very suitable foes with Takuma apparently requesting a world ranked opponent and Gonzalez wanting to make an impression before a proposed super fight with Yaegashi later in the year. The show, which will be shown on Fuji TV, genuinely looks like great one and it'll little wonder why Ohashi went with the name in question, even if it does feel like a rip off of Arum's recent show. Ohashi wants 5 world champions this year! Although every boxing fan around the world has heard of Teiken promotions it's fair to say far fewer have heard of "Ohashi". Despite Ohashi Gym being the second choice of many Japanese fans the gym hasn't really managed to make it's name well known around the world. The lack of "international recognition" hasn't stopped the gym from recently celebrating it's 20th birthday or announcing it's major plans for the next year or so, which have included the declaration that the gym wants 5 simultaneous world champions. At the moment the gym has 2. It has WBC Flyweight champion Akira Yaegashi and WBA Atomweight champion Ayaka Miyao. We know that Naoya Inoue will be attempting to become the gym's 3rd champion on April 6th when he fights Adrian Hernandez for the WBC Light Flyweight title. 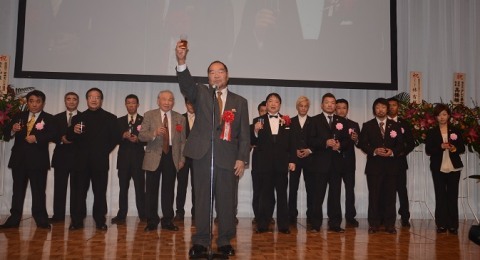 We're not sure who Ohashi founder Hideyuki Ohashi thinks will add titles to his stable but there are numerous challenger level fighters at the gym such as Ryo Matsumoto, Satoshi Hosono, Ryuji Hara and Go Onaga already at the gym and others may decide to join the gym in the near future. They may not be fighters that we'd tip right now, but by the end of the year it wouldn't be a huge shock for at least 1 of these men to have become a world title holder.